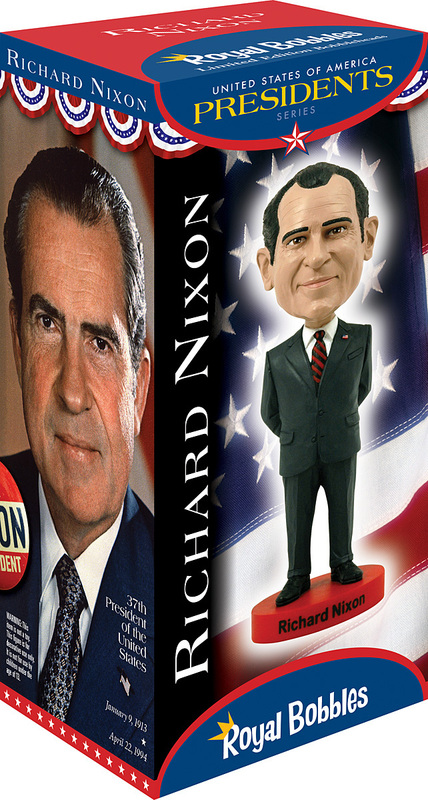 Richard Nixon, the 37th President, was born on January 9, 1913, in a small farmhouse in Yorba Linda, California. He attended Whittier College and Duke University School of Law and then joined a local law firm. He and Patricia Ryan were married in 1940. Nixon was elected president in 1968. He was also re-elected in 1972 by a historic margin. While in office he established valuable relationships with China, the Soviet Union, and led peace processes in the Mideast. He also established the EPA and brought about the peaceful desegregation of public schools in the South. However, the central event of the Nixon Presidency was the Vietnam War. In January 1973, the Paris Peace Accords were signed, ending U.S. military involvement and paving the way for the return of U.S. prisoners of war. After the war ended, Nixon was charged with complicity in blocking the FBI’s investigation of the June 1972 Watergate break-in. He resigned on August 9, 1974, in connection with this incident. Vice President Gerald R. Ford was sworn in as President the same day. After his presidency, he and Mrs. Nixon returned to San Clemente, where they lived until 1980 when they moved to New York. In retirement, President Nixon traveled throughout the world, visiting dozens of countries in Europe, Asia, Africa, and the Mideast. His ten books, all bestsellers, include Six Crises (1962); his memoirs; and his last, Beyond Peace (May 1994).